An Alleged "Day at the Seashore"
Dear Internet, I need your help. I'm going crazy. There's this one page right in the middle that doesn't rhyme. Since my daughter doesn't know how to read, I sometimes just skip that page. I've tried to think of something I could put in its place that would rhyme, but I haven't found anything yet. AND I have a theory (a conspiracy theory) about how the un-rhyming page got there. 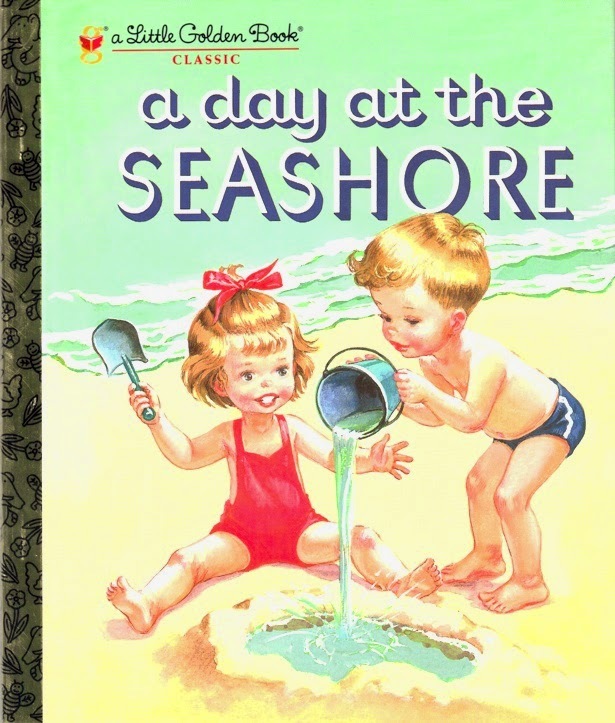 I was reading the front matter and noticed that it was originally published in 1951 as "A Day at the Beach by Simon and Schuster, Inc." and later republished as "A Day at the Seashore by Random House, Inc." in 1979. The out-of-place text is this: "You can stay near the edge and hold tight to the rope, and get used to the splash of the sea," which follows the page the says, "You can swim by yourself--if you're brave." Here's my theory. In the 50s, 60s and most of the 70s this book encouraged kids to be "brave" and swim by themselves. But someone living in the 70s (it could have been any of them) decided that they wanted kids to be "safe" and hold on to the rope, so they threw the page in there and republished it. Does anyone have the original book from the 50s? I want to know of the page is in there or not. I've been out of high school for over a decade, and I still can't ever remember if you should capitalize High School or not. Off an on, I get to see the direction my classmates' lives have taken since graduation. 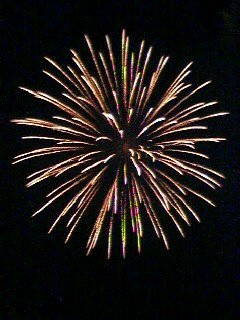 It resembles an aerial firework: at first we all seemed to be kind of headed in the same general direction, then BAM, everyone shoots toward a different place. Some trajectories were expected, some were not. Some of the surprises stem from youthful naivete; others from my own personal brand of naivete. Life has become a lot more real since the explosion. Both the sadness and happiness is more deep. At least it seems that way. While in school, I never imagined the extent to which I'd see this last statement come true in the lives of people I know. I see some pull away from the "work of the Lord" either wholly or piecemeal. They either "[keep the commandments] with slothfulness" or outright "obey not" and the Lord "[revokes] and they receive not the blessing." And then they blame the Church or its leaders for their misfortune! It's uncanny. Their misfortune is real. I won't dispute that. But it's bewildering when they head away from the very thing that would heal their misfortune. I ought to say "we" instead of "they" because I've been guilty or tempted to fall into the trap of half-keeping the commandments and then saying, "Seeeee!? It doesn't work. I proved it." Though we can lie to ourselves in our hearts and yell it out loud, it doesn't actually work like that. "Spiritual truth cannot be ignored—especially divine commandments. Keeping divine commandments brings blessings, every time! Breaking divine commandments brings a loss of blessings, every time!" If you feel offended, or ignored, or annoyed, or tired, or unfortunate in any way, consider the above in your heart and see where it leads. Tonight as I was helping M go to sleep she was picking her nose and said, "I got the boogers out, Dad. Want to see?" She rolled over so that her face was inches from mine, "Want to see my boogers, Dad?" How did she learn to communicate so well. We used to wonder what she thought about things and how she felt. Now we know! It's amazing that she talks. The other day, she tripped and fell next to the chair I was sitting in. She started to cry so I picked her up and was rocking her. She kept crying, so I kept rocking her. Eventually, still crying and annoyed she blurted out through sobs, "KISS ME!" So I kissed where she bonked and then all was well. 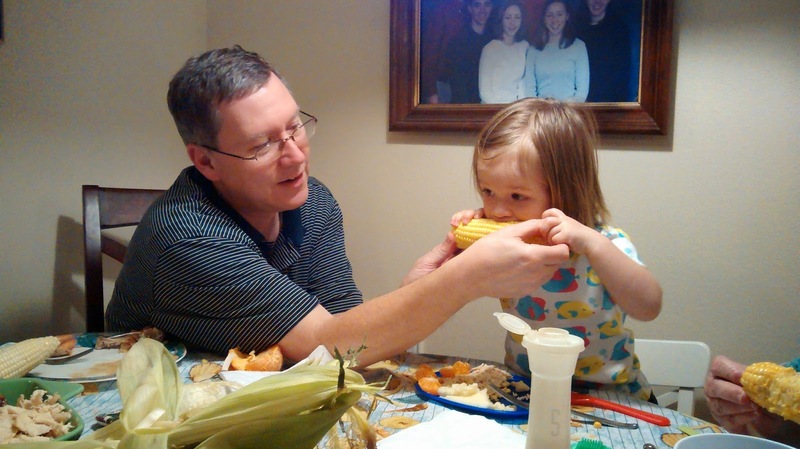 And he held the corn for her until she finished. This afternoon, I put some crackers in front of Madeleine. She wasn't eating them so I asked, "Do you want those crackers?" A few minutes later, I sat down next to her and grabbed a cracker (since she didn't want them). As I put it in my mouth she said, "Hey! That's my cracker." And smiled. I was sitting on the floor against our couch one evening this week when Madeleine came over to me with a Q-tip. She started gently rubbing my knee with it. I thought it was odd, but didn't think too much about it. Later, when I saw her rubbing Mom's knee, I thought, "Why is she rubbing our knees with Q-t....."
Oh yeah. A few weeks ago when she first found them, Christy astutely said, "I don't want her to know what you really do with Q-tips." I agreed, imagining her shoving them in her ears and nose (or worse: my ears and nose while I was sleeping). So we quickly showed her that Q-tips are for rubbing our knees. Christy wanted to make beef stew from scratch, which meant no canned cream of mushroom soup. I meandered through Harmon's produce area wondering where they kept their mushrooms and realized, just as I found them, that I have never in my life bought mushrooms. I stood in front of the mushroom wall suddenly ignorant and a little amazed. I don't particularly like mushrooms. As a kid they grossed me out. Post mission I've learned to enjoy the flavor they contribute, though I only allow about half of them to make it down my gullet. In this sense, it's not surprising that I've neglected their purchase. On the other hand, I'm older than over 95% of 25-year-olds -- you'd think I'd have bought them by now. So there I stood, looking at "button" mushrooms and portobello mushrooms, white ones and flimsy, hair-like ones. All kinds of mushrooms. Many of them live in cardboard boxes that remind me of the containers you get tulip and daffodil bulbs from, as if to emphasize: "These, O man, are Of the Earth." Looking over their variety, and knowing that I didn't know the difference between any of them, I felt lost and little excited. I thought, "There are people that like these things. And they know what to do with them. I wonder if I could be one of those people. I wonder if I could make delicious things from this mostly mysterious fungus. Yuck... these are fungus. But they look kind of good." It was kind of fun to discover something so new; doubly so because I've walked past them many, many times. But practically, I had yet to choose some. I waffled among1 the familiar looking, plastic wrapped container of pre-cut, "normal-looking" ones, the relatively gigantic portobellos and the quaint button-shaped ones. Then I noticed a lady politely waiting for me to make my choice. Instead of rushing, I backed away and asked, "Are you getting mushrooms?" "I've never bought mushrooms in my whole life. Which ones should I get?" Her eyes lit up (I'm not exaggerating -- she was visibly excited). Can you imagine my luck? I had just presented my question to one of the aforementioned people-that-like-mushrooms-and-know-what-to-do-with-them. She was a real fan! After also waffling among a few, she recommended quartering the button guys -- they would hold up okay in a stew and taste good. I let her finish, thanked her and got some of my own. The stew was terrific, and I consciously enjoyed the few mushrooms that ended up on my spoon. I know that between is used only with pairs of things and among is used when speaking of three or more things. I think waffling probably should only be used in between situations. But "waffling among" is too funny a phrase to pass up. It brings to my mind a lumbering, finned creature wallumphing through a flower-filled spring meadow. 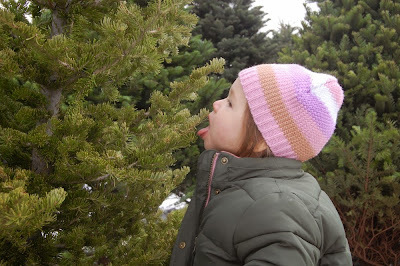 Picking out our (suprisingly still-fragrant) Christmas tree. She thinks, for some reason I don't quite understand, that you can get drinks from trees. After I parked outside the building where I work on one of the snowy/icy days this last week, I gathered up my water bottle and two mandarin oranges and got out of the car. As I navigated the icy parking lot trying not to slip, I suddenly thought, "Well, at least if I fall over, these two oranges will go flying and make anyone who sees it laugh." That made me smile. I didn't end up slipping. How sad. Today was little M's second time going to nursery (she's been sick ever since the first time). 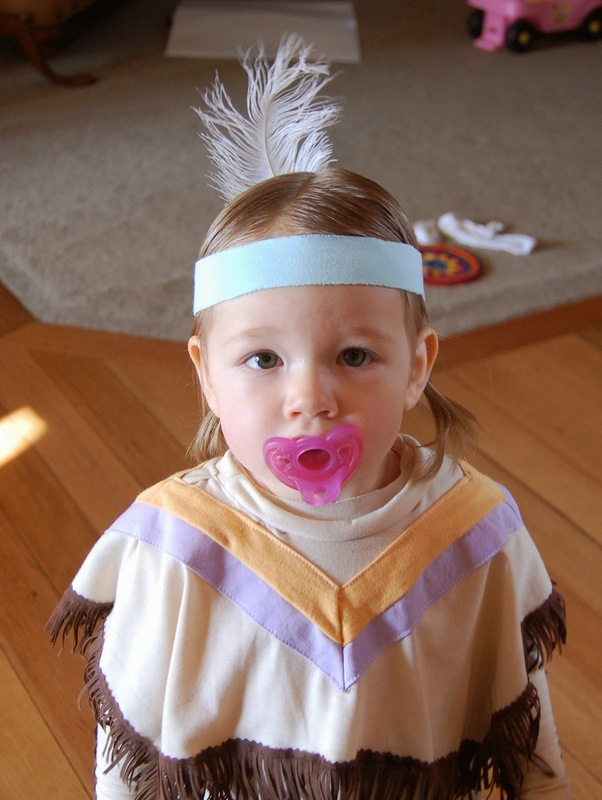 When we got home, she refused to nap, so we decided not to fight it and ate dinner. By the end of dinner, she was struggling to stay awake so we put her to bed. At 5:30! Out like a light. Here's hoping that it lasts through the night. During the summer, we saw the hot air balloon launch for Independence Day. We got right up close to the balloons -- enough that we could feel the heat every time they turned on the fire. Ever since, Madeleine always makes the sound of fire whenever we talk about fire. I don't know how to spell the sound... something like: "fffffhhhhhuhhuhhhh"
A few months ago, we had a fire in our fire place. Kimmy was over and taught Madeleine that the fire was dangerous by saying, "Danger!" and moving her hands back and forth as if to say stay away. So Madeleine often says "danger!" when she's near the fire place. We've all been sick lately (colds, coughs and congestion) and so we've had the humidifier running in Madeleine's room at night to alleviate that a bit. Since we narrate everything we do when Madeleine's around (We're not the only parents that do this, are we? We're not crazy, right?) she knows that it's called a humidifier. All three of us are sick with colds. Madeleine has it the worst, but is improving. Christy seems to be on the downhill. Mine ebbs and flows. But despite our noses and throats, we decided to fly a kite today in the great wind. After not finding any kites in the stores we decided to try making our own. We used some small wooden dowels, butcher paper, Scotch tape, some string and a leftover birthday streamer for the tail. I was confident it wouldn't fly, but also sure it would still be a fun activity. I was wrong about the former and right about the latter. Our cheap little kite flew high! It was fun flying a kite, and doubly fun that we made it with stuff around the house. Today was Madeleine's first week going to Nursery for the last two hours of church. We walked to the door, and, interested, she went inside and paused. After looking at all the activity and toys and kids she turned around briefly, but then got swept up in the flow of another mom bringing her daughter in. She loved it! Christy cheated and checked on her in the middle of Sunday School. I stole a peek in between the two hours. I saw my cute little girl seated at the table with all the other kids just finishing snack time. I wonder if a lot of her life changes (school, high school, work, college, marriage and all the little ones in between) will happen the same way: she enters into a new adventure entirely unaware of her parents standing at the window, watching her with a lot of excitement and a little nervousness. A Mess-Making 3 Year Old Parable. I Guess. Where on Earth Have I Been? ?